This will likely be the largest purchase you ever make — it's going to require a little more research than just paint colors. If you are going to take the plunge and buy a new home, then commit to learning as much as you can about the process. You could save yourself thousands of dollars and lots of stress in return. Your monthly mortgage payment, including taxes and insurance, should be no more than 28 to 33 percent of your gross income, while your total loan payments should not exceed 40 percent. How much cash do you have saved for a down payment, while still maintaining your emergency fund? (Learn more about emergency funds and budgeting your money.) The larger your down payment, the lower your monthly payment and less interest you pay over the life of the loan. If you can afford a 20 percent down payment, you can also avoid paying PMI (Private Mortgage Insurance). Do a "practice run” for three to six months. Save the difference between your current monthly rent and your anticipated monthly mortgage payment including taxes and insurance. 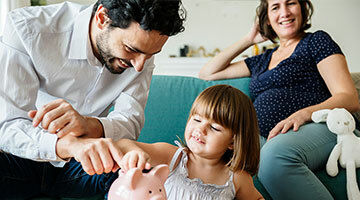 See if you can maintain the lifestyle you're accustomed to while not neglecting savings activities such as college funds for the kids or your IRA. If you find yourself falling short you may want to consider a smaller mortgage. A relationship with a real estate agent can be defined in one of three ways. Make sure you understand what your relationship will be before you hire an agent. A seller's agent works for the seller. They are required to give a buyer honest information, but they are not required to help the buyer get the best deal. A buyer's agent works for the buyer and the buyer's best interest. If you're a first-time homebuyer, you will absolutely want a buyer's agent. Sometimes situations arise where one agent is representing both the seller and the buyer. As you can imagine, this places the agent is a somewhat awkward position. Unless the terms are already mutually agreeable, it's difficult for the agent to fully work for either party's best interest. Dual agency can also exist when both the seller's and buyer's agents work for the same brokerage. This is less of a concern the individual agents are each only obligated to one party. Make sure you understand how to insure the biggest purchase in your financial life. Insurance for your home that protects your belongings, and wallet too. Whether this is your first time purchasing a home or you have experience with mortgages your credit union wants to help you in the process. BFCU has partnered with LenderSelect Mortgage Group to offer you a variety of mortgage products and accurate information so you can choose the right loan for your personal financial situation. Visit the LenderSelect Mortgage GroupOpens in New Window site for a Mortgage Calculator and to learn more about available mortgage products.